Flavors of summer! Fruity and crisp! Soak fruit in 1 bottle of Honeyed Pineapple Mead for several hours or overnight. Before serving, add optional 1/2 bottle of Honeyed Peach. Combine in a tall glass. Enjoy with an umbrella! Or under an umbrella! 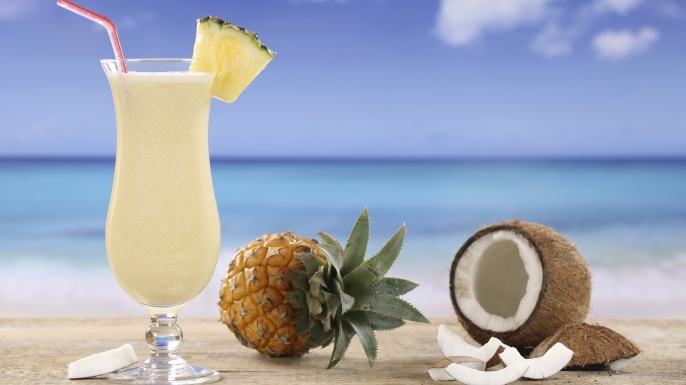 Our twist on a Pina Colada! Take it to the beach! Or drink it at home! Mix all ingredients together and enjoy chilled! Crisp, not too sweet, strawberry with a honey undertone! Yum! Combine 1 bottle mead with fruit and put in fridge overnight. Before serving, scoop out some of the fruit to add to glasses and mix in second bottle of mead. Enjoy! In honor of our furry friends at Carolina Tiger Rescue! Mix fruit with bottle of mead and let sit 2-4 hours. When ready to serve, fill glass 3/4 full with sangria, top up with ginger ale. A festive choice for all those patriotic holidays! Before serving, scoop out some of the fruit to add to glasses and mix in second bottle of mead for sweetness. Enjoy! Summer is just screaming for this one! Combine sliced fruit and mead, let sit overnight. Before serving, fill glass 2/3 full with sangria, top up with sparkling water. Tip: You can also add your favorite hard liquor to any of these recipes! Try Lemon or Lime flavored Vodka, Spiced Rum or another favorite! Measure 6 oz of mead into each bag. Carefully squeeze extra air out of bag and zip closed. Lay bags flat in freezer-safe dish or container. Freeze for 6 hours or overnight (6 hours for cold mead, overnight for room temperature). Before serving, massage bag gently to break up ice crystals and create slushie!